Author contributions: Maran S, Lee YY, Xu S, Majid NA and Zilfalil BA were involved in the design, analysis and writing of manuscript; Maran S performed the studies, with assistance from Rajab NS and Hasan N; Syed Abdul Aziz SH, Rajab N and Hasan N provided ideas to the study and manuscript. AIM: To identify genes associated with gastric precancerous lesions in Helicobacter pylori (H. pylori)-susceptible ethnic Malays. METHODS: Twenty-three Malay subjects with H. pylori infection and gastric precancerous lesions identified during endoscopy were included as “cases”. Thirty-seven Malay subjects who were H. pylori negative and had no precancerous lesions were included as “controls”. Venous blood was collected for genotyping with Affymetrix 50K Xba1 kit. Genotypes with call rates < 90% for autosomal single nucleotide polymorphisms (SNPs) were excluded. For each precancerous lesion, associated SNPs were identified from Manhattan plots, and only SNPs with a χ2P value < 0.05 and Hardy Weinberg Equilibrium P value > 0.5 was considered as significant markers. RESULTS: Of the 23 H. pylori-positive subjects recruited, one sample was excluded from further analysis due to a low genotyping call rate. Of the 22 H. pylori-positive samples, atrophic gastritis only was present in 50.0%, complete intestinal metaplasia was present in 18.25%, both incomplete intestinal metaplasia and dysplasia was present in 22.7%, and dysplasia only was present in 9.1%. SNPs rs9315542 (UFM1 gene), rs6878265 (THBS4 gene), rs1042194 (CYP2C19 gene) and rs10505799 (MGST1 gene) were significantly associated with atrophic gastritis, complete intestinal metaplasia, incomplete metaplasia with foci of dysplasia and dysplasia, respectively. Allele frequencies in “cases”vs“controls” for rs9315542, rs6878265, rs1042194 and rs10505799 were 0.4 vs 0.06, 0.6 vs 0.01, 0.6 vs 0.01 and 0.5 vs 0.02, respectively. CONCLUSION: Genetic variants possibly related to gastric precancerous lesions in ethnic Malays susceptible to H. pylori infection were identified for testing in subsequent trials. Core tip: Gastric cancer and its precancerous lesions are exceptionally rare among ethnic Malays. Gene variants may be associated with precancerous lesions in Helicobacter pylori-susceptible Malays. Genome-wide association was performed to identify gene variants in Malays with a spectrum of gastric precancerous lesions. Results indicated that at different phases of the Correa cascade, different gene variants were manifest, but they followed a pattern of progression similar to their histological and clinical stages. It is possible that, in addition to histological staging, gene variant markers may serve to identify different phases of gastric cancer progression in the near future. Gastric cancers are thought to arise from a cascade of histological changes or precancerous lesions (atrophic gastritis, intestinal metaplasia and dysplasia) before developing into full-blown malignancy. In Japan, studies have shown that surveillance of these precancerous lesions is associated with increased detection of early gastric cancers and improved survival rates[2,3]. These precancerous lesions are associated with Helicobacter pylori (H. pylori) infection acquired since childhood. In populations with a high prevalence of H. pylori infection, including those in China and Japan, precancerous lesions can be detected in up to 80% of adults. Eradication of H. pylori infection at this stage has not been shown to be effective in these high risk populations. Ethnic Malays residing in the north-eastern region of Peninsular Malaysia (state of Kelantan) have an exceptionally low prevalence of H. pylori infection[7,8]. Exact reasons for this low prevalence are unknown, but it could be a combination of unique environmental, host and strain virulence factors shaped by the population’s evolutionary history[9-12]. Due to the extremely low acquisition of H. pylori infection, gastric cancer and its precancerous lesions are extremely rare in this population[13-15]. In a survey of 234 subjects undergoing upper endoscopy in a tertiary hospital from the state of Kelantan, the reported rate of atrophic gastritis was 42.3% and intestinal metaplasia was present in 7.7% (14/234) of all biopsies, but was only present in 1.4% (2/146) of the ethnic Malays. This low rate of gastric precancerous lesions observed was a result of a low prevalence of H. pylori infection in the studied population of only 6.8%. As shown in a multivariable analysis, the risk of intestinal metaplasia and dysplasia was only significant in the presence of H. pylori infection. A minority of this Malay population is genetically susceptible to H. pylori infection, and DCC gene polymorphism has recently been found to be responsible. An aberrant methylation of this tumor suppressor gene has been observed to occur in the course of gastric carcinogenesis. As such, this population may also be genetically susceptible to the development of gastric precancerous lesions. The current study aimed to determine the gene polymorphisms associated with gastric precancerous lesions in the Malay population from north-eastern region of Peninsular Malaysia using the genome-wide association approach. Only those ethnic Malay subjects (age range 20-80 years) whose gastrointestinal symptoms required upper endoscopy were screened for study eligibility. To avoid ascertainment bias, subjects had upper gastrointestinal symptoms (including dyspepsia and/or abdominal discomfort) and required upper endoscopy to exclude gastro-duodenal diseases before being included into the study. All Malay subjects included in the study were born in the state of Kelantan, had resided within the region for at least 3 generations and were from different families but had similar socio-economic and socio-cultural backgrounds. Subjects positive for H. pylori infection according to a urease test and histology and with gastric precancerous lesions identified during endoscopy were categorized as “cases”, while those negative for H. pylori infection and precancerous lesions were categorized as “controls”. “Cases” and “controls” were matched for age and gender. Subjects satisfying the above inclusion criteria were recruited into the study. Exclusion criteria included an intake of antibiotics 3 mo prior to the upper endoscopy test, upper gastrointestinal bleeding, a positive family history of H. pylori infection and gastric cancer, a previous history of H. pylori infection and chronic psychiatric and medical conditions, including cancer. Informed consent was obtained from all subjects prior to their enrolment into the study. Cases with H. pylori infection and positive for precancerous lesions were extremely limited in number due to an exceptionally low rate of H. pylori infection among ethnic Malays. Only 23 Malay subjects were eventually included as “cases”. A larger sample size for the “controls” was sought to compensate for the low sample size in “cases”. Furthermore, stringent criteria were set to ensure that only subjects of similar age, socio-economic and socio-cultural backgrounds were included in the study. From a total of 45 screened subjects, 37 Malay subjects were recruited as “controls” with eight subjects being excluded as they did not meet the inclusion criteria, they did not give consent or blood samples were poor. The study was approved by the Human Research and Ethics Committee of Universiti Sains Malaysia (USM). All upper endoscopies (model GIF-140 and GIF-160; Olympus Medical Systems, Tokyo, Japan) during this period were performed by one endoscopist with at least 5 years’ experience. If needed, patients were sedated accordingly. Subjects who did not stop proton pump inhibitors 2 wk before endoscopy, those who had received antibiotics prior to study, and patients who had upper gastrointestinal bleeding shortly before the study were excluded. Endoscopic findings of gastritis and atrophy were recorded and classified based on established Sydney criteria and Atrophy Club criteria. Biopsies were taken using standard biopsy forceps at the antrum, incisura and body. A minimum of 2 to 4 biopsies (size between 2 to 4 mm) were taken in each sites and these gastric biopsies, preserved in formalin containers, were transported to the pathology laboratory on the same day. Only one histopathologist was involved in reviewing all the slides. All biopsies were stained with routine hematoxylin and eosin (HE) stain followed by Alcian blue-periodic acid Schiff stain for the detection of intestinal metaplasia. The Warthin Starry stain would be used in sections where the H. pylori bacterium was not detected in the routine HE stain. Chronic atrophic gastritis was identified based on the updated 1994 Sydney system and Atrophy Club definitions. Intestinal metaplasia was identified by replacing glandular epithelium with goblet cells. Intestinal metaplasia was classified into complete or incomplete types. Complete type resembled the small intestinal phenotype with well-formed goblet cells while incomplete type resembled the colonic phenotype with irregular mucin droplets and absence of a brush border. Dysplasia was identified by epithelium disarray and increased nucleo-cytoplasmic ratio. For the purpose of the genotyping study, subjects were grouped as follows: atrophic gastritis only, complete intestinal metaplasia, incomplete metaplasia with foci of dysplasia, or dysplasia only. All recruited subjects were called up by one of the investigators (SM) to have 1 mL of venous blood taken during the study day. Unlike conventional methods of DNA extraction, 1 mL of blood was sufficient for the commercially available kits. The blood was collected in an EDTA tube and was transported immediately to a facility (Human Genome Centre, USM, Kubang Kerian, Malaysia) to be stored at 4 °C. Subsequently, DNA for all recruited cases and controls was isolated using QIAamp DNA Blood Mini Kit (QIAGEN, Hilden, Germany). The isolated DNA from all recruited cases (n = 23) and controls (n = 37) were processed and genotyped using Affymetrix 50k Xba1 array (Affymetrix, United States) following the instructions provided in the Affymetrix GeneChip Human Mapping 100K Assay Manual. Genotypes with call rates < 90% for autosomal single nucleotide polymorphisms (SNPs) were excluded. SNPs that had a minor allele frequency < 5%, that failed to genotype in > 5% of samples, or had a Hardy-Weinberg Equilibrium (HWE) P-value < 0.5 were also excluded from the analysis. Genotype calling to assess the normalization of the SNPs was performed with the Bayesian Robust Linear Model with Mahalanobis distance classifier (BRLMM) algorithm from the Affymetrix® Genotyping Console™ software version 4.0 (Affymetrix, United States). Quality control for genetic markers was assessed using the Genotype filtering tool in the SVS Golden Helix Bioinformatics Tools version 7.4 (Golden Helix Inc., Bozeman, MT, United States). Association was evaluated for every single SNP in each gene with SVS Golden Helix Bioinformatics Tools. False Discovery Rate, and Bonferroni adjustments were used for multiple-testing corrections. A Manhattan plot for each phenotype was generated to determine SNPs with the highest significant value associated with that phenotype using SVS Golden Helix Bioinformatics Tools (version 7.4). A significant genomic threshold of 3 × 10-7 in Manhattan plots was set in this study and a χ2P value for each SNP was calculated based on Fisher’s exact χ2 test. For each type of precancerous lesion studied, of which a group of associated SNPs were identified from Manhattan plots, only a SNP with χ2P value < 0.05 and HWE P value > 0.5 was considered as a significant marker. Of the 23 H. pylori-positive subjects recruited, one sample was excluded from further analysis due to a low genotyping call rate (< 90%). The mean age of the remaining 22 “cases” was 56.5 ± 16.5 years, and was 53.2 ± 15.2 years for the 37 “controls”. Cases were 54.5% (12/22) male compared with 50% (17/37) in “controls”. Of subjects positive for H. pylori infection (cases), atrophic gastritis only was present in 50.0% (11/22), complete intestinal metaplasia was present in 18.2% (4/22), both incomplete intestinal metaplasia and dysplasia was present in 22.7% (5/22) and dysplasia only was present in 9.1% (2/22). None of the gastric precancerous lesions were present in subjects negative for H. pylori infection (controls). In 10 “cases” with atrophic gastritis only, compared with controls, 26 SNPs were above the significant genomic threshold. Five of the identified 26 SNPs were in HWE, of which rs9315542, located in chromosome 13 q13.3 (UFM1 gene), was the most significant associated SNP (χ2P value = 0.007) (Table 1, Figure 1). The allele frequency for rs9315542 in cases vs controls was 0.4 vs 0.06. Table 1 Single nucleotide polymorphisms associated with atrophic gastritis among Malays with Helicobacter pylori. rs ID: The unique ID for the identified single nucleotide polymorphisms; HWE: Hardy-Weinberg Equilibrium. 1All markers were run using the FAMHAP (Haplotype Association Analysis) program. The P value represents the simulated overall significance for the particular marker corrected for multiple testing and P < 0.05 was considered statistically significant. Figure 1 Manhattan plots for different gastric precancerous lesions (phenotype) in susceptible Malays with Helicobacter pylori. Red line indicates genomic threshold (3 × 10-7) set to determine single nucleotide polymorphisms (SNPs) in Hardy-Weinberg Equilibrium associated with the studied phenotype. The most significant SNP, as determined by the χ2P value, for each phenotype is shown by an arrow. In 4 “cases” with intestinal metaplasia only, compared with controls, 13 SNPs were above the genomic threshold and were in HWE, of which rs6878264, located in intron 4 of the thrombospondin 4 (THBS4) gene, was the most significant associated SNP (χ2P value = 0.01) (Table 2, Figure 1). The allele frequency for rs6878264 in cases vs controls was 0.6 vs 0.01. Table 2 Single nucleotide polymorphisms associated with intestinal metaplasia among Malays with Helicobacter pylori. In 6 “cases” with both intestinal metaplasia and dysplasia, compared with controls, 17 SNPs were above the genomic threshold and in HWE, of which rs1042194, located in exon 8 of the CYP2C19 gene, was the most significant associated SNP (χ2P value = 0.00536) (Table 3, Figure 1). The allele frequency for rs1042194 in cases vs controls was 0.6 vs 0.01. Table 3 Single nucleotide polymorphisms associated with intestinal metaplasia and dysplasia among Malays with Helicobacter pylori. Finally, in 2 “cases” with dysplasia only, compared with controls, 2 SNPs were above the genomic threshold and in HWE, of which rs10505799, located in chromosome 12p12.3 (MGST1 gene), was the most significant associated SNP (χ2P value = 0.006) (Table 4, Figure 1). The allele frequency for rs10505799 in cases vs controls was 0.5 vs 0.02. Table 4 Single nucleotide polymorphisms associated with dysplasia among Malays with Helicobacter pylori. In this Malay population with an extremely low risk of H. pylori infection, gastric cancer and its precancerous lesions are very rare. However, in the current study of subjects susceptible to H. pylori infection and those who developed precancerous lesions, certain gene polymorphisms were found to be more commonly associated with precancerous lesions. Notwithstanding the low sample size, resulting from the extremely rare occurrence of gastric precancerous lesions in this population, the current study, with the use of the genome-wide association approach, allowed identification of genetic markers that can be tested in a larger cohort in the near future. In the 50% of H. pylori-infected subjects with atrophic gastritis, the earliest lesion in the Correa cascade, rs9315542, located in chromosome 13 q13.3 (UFM1 gene), was the identified marker. A recently identified expressed protein, ubiquitin-fold modifier 1 or UFM1, is a member of a large family of ubiquitin-like proteins or Ubls. Ubiquitin, a small protein, is associated with the process of “ubiquitination”, a target of proteins for degradation by the proteasome. At the moment, the exact cellular functions of proteins modified by UFM1 remain elusive. A recent report indicated that components of the UFM1 conjugation pathway are highly expressed in the beta cells of the pancreas and some other protein secretory tissues. In the same report, UFM1 conjugate prevented endoplasmic reticulum (ER) stress-induced apoptosis. While UFM1 in gastric tissue has not been investigated, it is known that gastric mucosa secretes a number of peptides and hormones, including pepsinogen and ghrelin, whose levels are reduced in atrophic gastritis. Speculatively, UFM1 may be a marker of the secretory status of the gastric mucosa, similar to pepsinogen, and remains to be tested and validated. Complete-type or type I intestinal metaplasia, considered as the benign version compared with the incomplete-type, was present in 18.2% of H. pylori-infected subjects. In these subjects, rs6878264 located in intron 4 of the THBS4 gene, was the identified marker. THBS4 is a member of the THBS protein family, a glycoprotein in the extracellular matrix, which mediates cell-to-cell and cell-to-matrix interactions. Although the exact physiological functions of THBS4 are unknown, the published literature indicate that it promotes neurite outgrowth, stimulates proliferation of erythroid cells, skin fibroblasts and kidney epithelial cells, as well as myoblast adhesion and interaction with other extracellular matrix proteins[28-30]. Recently, THBS4 has been found to be associated with gastric adenocarcinomas especially of the diffuse type. While H. pylori infection is associated with atrophic gastritis and intestinal metaplasia, it is not commonly associated with diffuse-type gastric adenocarcinoma. Complete-type intestinal metaplasia represents a reparative process of the epithelium following H. pylori-induced gastritis, and in this context, THBS4 may act as an early proliferative marker but may have a more aggressive pro-oncogenic role in advanced stages. Again, this is speculative in the absence of any published studies, but it is a worthwhile marker for further studies. Incomplete type intestinal metaplasia is more advanced compared with complete type, and therefore is more closely associated with dysplasia. 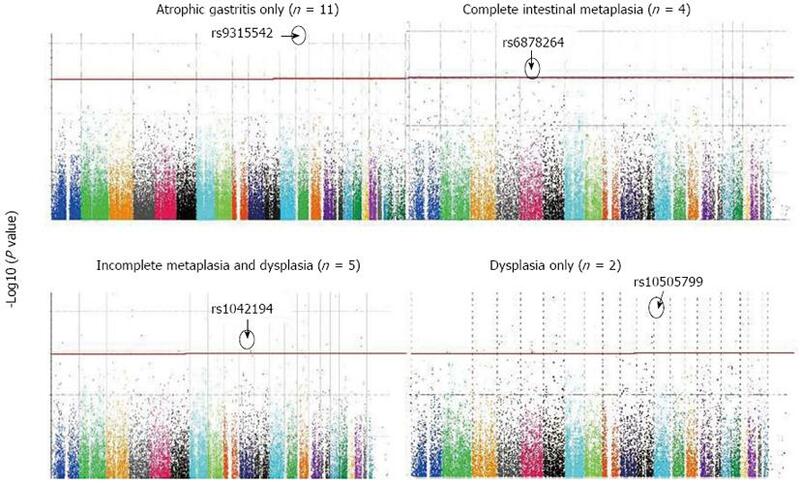 In 22.7% of cases with both incomplete type intestinal metaplasia and dysplasia, rs1042194 located in exon 8 of CYP2C19 gene was the identified marker. Cytochrome (CYP) P450 2C19, one of the isoforms of the CYP enzyme (phase I detoxification enzyme), plays an important role in metabolism of drugs and also detoxification of potential carcinogens. Several studies indicated that CYP2C19 gene polymorphism is associated with increased cancer susceptibility including hepatocellular carcinoma, and lung, esophageal and gastric cancer, especially in patients having a poor metabolizer (PM) genotype[34-36]. A study from Malaysia found that the PM genotype was uncommon among ethnic Malays (5.9%), compared with Chinese (19.1%) and Indians (10%). This may be one of the reasons for reduced susceptibility to gastric cancer and its precancerous lesions among ethnic Malays. The finding of CYP2C19 in incomplete type intestinal metaplasia and dysplasia in a group of Malay subjects susceptible to H. pylori infection is therefore important and merits further study. Dysplasia, a histological stage with high risk of malignant transformation, was present in only 9.1% or 2/23 subjects infected with H. pylori. Compared with controls, rs10505799 located in chromosome 12p12.3 (MGST1 gene) was found to be the SNP marker associated with dysplasia. Microsomal glutathione S-transferase 1 (MGST1) is one of the glutathione S-transferase (GST) family of enzymes, and GSTs are phase II detoxification enzymes, which, similar to CYP enzymes, are involved in the detoxification of potential carcinogens[38,39]. Recently, MGST1 gene polymorphism was found to be involved in colorectal carcinogenesis in the Chinese population but there is no data as yet on gastric cancer. However, since MGST1 and CYP2C19 are both carcinogen detoxification enzymes, with evidence supporting their involvement in gastrointestinal tract carcinogenesis, the role of MGST1 in gastric precancerous lesions is likely to be valid. The limited number of cases with dysplasia in the current study means that the results need to be interpreted cautiously, but the potential of MGST1 as a marker for dysplasia should not be disregarded. There are a number of studies on gene polymorphisms associated with gastric precancerous lesions in high prevalence populations, but our study covered the entire spectrum of the Correa cascade in a population with an extremely low burden of gastric cancer and H. pylori infection. Development of gastric cancer is thought to involve multi-step carcinogenesis and follows a progressive pattern of pathological stages described by Correa. Our results indicated that, at different phases of the Correa cascade, different gene variants are manifest, but they follow a pattern of progression similar to their histological and clinical stages. During the stage of atrophic gastritis, UFM1 expression reflects the secretory status of epithelium. With early development of intestinal metaplasia, THBS4 acts as a proliferative marker but at more advanced stages, incomplete intestinal metaplasia and dysplasia involve polymorphisms of detoxification enzymes, CYP2C19 and MGST1. Based on the current study, it is possible that, in addition to histological staging, gene variant markers may also serve to identify different phases of progression of gastric cancer in the near future. Recently, epigenetic silencing of FOXD3 has been shown to be an early event in gastric carcinogenesis and, together with genomic changes, it would allow a greater understanding of the pathogenesis of gastric cancer. We acknowledge from the outset that the current study, based upon a genome-wide approach, was extremely limited in sample size, as gastric precancerous lesions are extremely rare among ethnic Malays from the north-eastern region of Peninsular Malaysia. In this respect, bioinformatics and statistical approaches were taken into consideration for a more reliable analysis of the data. To reduce false-positive results, a more stringent significance threshold of 3 × 10-7 was set for Manhattan plots in the current study. Only SNPs in HWE P-value > 0.5 were selected to reduce occasionality. In addition to being long-term residents within the studied region, cases and controls were similar in age, socio-cultural and economic backgrounds. The current study only identified SNPs associated with gastric precancerous lesions, and further validation studies are in progress to confirm their regulatory role in carcinogenesis. In conclusion, we have shown that, compared with controls, susceptible ethnic Malays with H. pylori infection expressed different SNP markers at different spectrums of gastric precancerous lesions. These markers may allow efficient screening of precancerous lesions in larger cohorts of H. pylori-infected individuals. Shuhua Xu is Max-Planck Independent Research Group Leader and member of CAS Youth Innovation Promotion Association. Shuhua Xu also gratefully acknowledges the support of the National Program for Top-notch Young Innovative Talents and the support of K.C. Wong Education Foundation, Hong Kong. Gastric cancer and its precancerous lesions are exceptionally rare among ethnic Malays. Gene variants may be associated with precancerous lesions in Helicobacter pylori (H. pylori)-susceptible Malays. In a case-control study, genome-wide association was performed to identify gene variants in the Malay population with a spectrum of H. pylori-associated gastric precancerous lesions. Results indicated that at different phases of the Correa cascade, different gene variants were manifest, but they followed a pattern of progression similar to the histological and clinical stages. It is possible that, in addition to histological staging, gene variant markers may also serve to identify different phases of progression of gastric cancer in the near future. The genome-wide approach utilises microarray technology to identify thousands of single nucleotide polymorphisms (SNPs). Using novel bioinformatics and statistical approaches, the association between SNPs and the studied disease can be determined reliably. Current study indicates that different gene variants exist that reflect different stages of progression during different spectrums of gastric carcinogenesis. These gene variants, appropriately confirmed in later studies, may be useful markers, in addition to histological staging, of gastric precancerous lesions.